Once again, I’m writing a blog post from an airport café. This time, I’m in Dubai airport waiting formy flight to Lebanon. AUD’s spring break started yesterday, so I’m travelling to Beirut for the first time. I’m even going to see my wonderful boyfriend, as well as a few friends from AUD. The central location of Dubai makes travelling for spring break affordable and enticing, even though there is a lot to do in Dubai were students to stay in the city. I’ll be in Lebanon the whole time, but other study abroads are visiting Cyprus, Turkey, Singapore, and Sri Lanka. 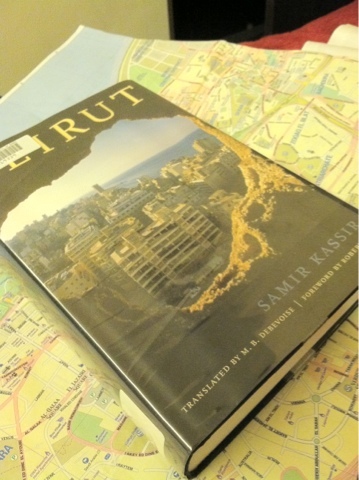 I’m incredibly excited for Lebanon and have been reading a massive history on Beirut for the last two days. I know I will love the city, even more than I knew I would love Paris. Beirut is in my opinion the most resilient city on the planet: historical, cosmopolitan, and gruesome all at once. The book I’m reading has some beautiful lines about Beirut and reads more like a novel than a history. I’m of course reading the English translation, but maybe one day I’ll be ready to reread the French original. Regarding my current situation, I’m appreciating my time here at the airport because this is one of the first times I've been completely surrounded by Arabic speakers in Dubai. Earlier, I was surrounded by Saudi men, who were staring me down pretty hard. In a dramatic showing, I had a conversation in broken Arabic with Jeed on the phone. You could argue that I just did so to show off, but when alone, I also find that I’m hassled a bit less if it’s clear that I know at least some Arabic. Just moments before, I had been walking near two men gesturing towards me and speaking to each other. I didn’t catch all of the slang they were using, but the conversation centered around one gentleman’s “er.” I’m pretty glad that I didn't understand my role in the discussion, but, had I been speaking Arabic, the entire conversation would have likely not taken place. It seems that every day, I’m finding a new personal anecdote to include in discussions on the sexualization of women, particularly foreign women, in Dubai. Anyway, I think it’s time to work my way to my gate, maybe even to swing by a restroom and attempt to wash yet another coffee spot off of my clothes. Happy travels to everyone doing their own adventuring this spring break! I am a Political Science student at Troy University in southeastern Alabama. I have been given fantastic opportunities to travel to Saudi Arabia and the United Arab Emirates, among other brief trips, to study and glimpse other cultures. I believe there is much to be learned about other people while studying, and I want to share my experiences with you.